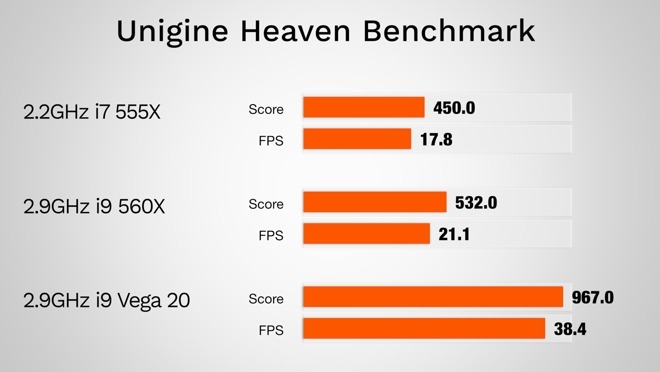 In a previous benchmark comparison, we saw that the extra performance of Vega 20 graphics was well worth the extra $350, with it achieving close to double the frames per second of the 560X graphics option in Unigine's Heaven gaming benchmark. The next step is shaking it all down in one of the most popular games online, Fortnite. In the graphics settings, the game automatically set the resolution to 1,680 by 1,050, which isn't quite as high as the standard 1080p. All of the graphics presets were also set on High. While playing, the frame rate constantly hovered from around 50 to 60 FPS, and the game ran very smoothly. There weren't many dropped frames, so there were no issues with performance spikes during shootouts. We did notice the fans kick up not too long after starting to play, but they definitely weren't as loud as a lot of other Windows gaming notebooks, even Windows notebooks in general. A major issue we ran into was the fact that the new MacBook Pro features the Touch Bar, which lacks the top row of physical function keys, which is coincidentally what is used for building. You have to hold the FN button to reveal those keys before you can press them, so if you're serious about playing Fortnite, you're either going to have to use an external keyboard or change the keybindings for all of the building keys. 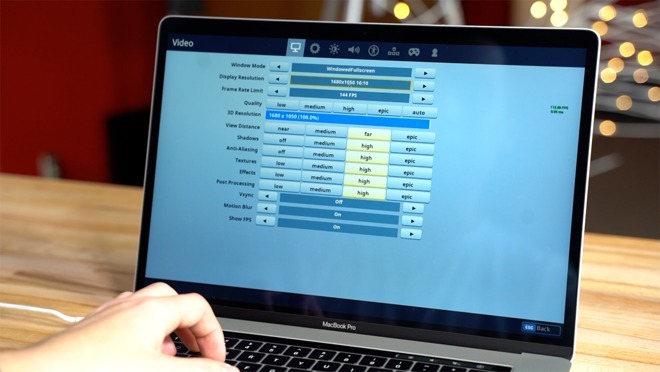 Either way, we're extremely impressed with the performance of the Vega 20 MacBook Pro. You would usually have to use an external GPU or something more powerful, like a desktop iMac, to be able to play at decent frame rates like these. 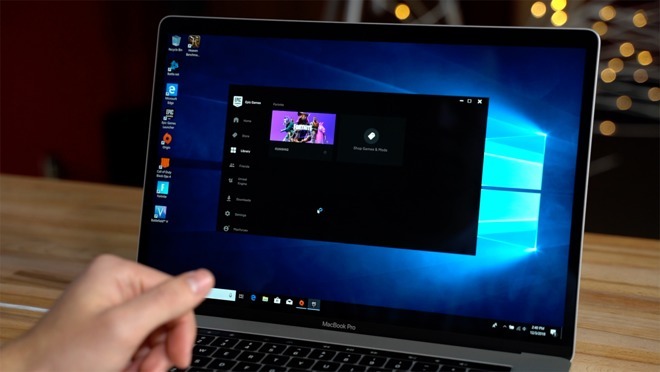 The second phase took place on Windows 10 using Bootcamp. 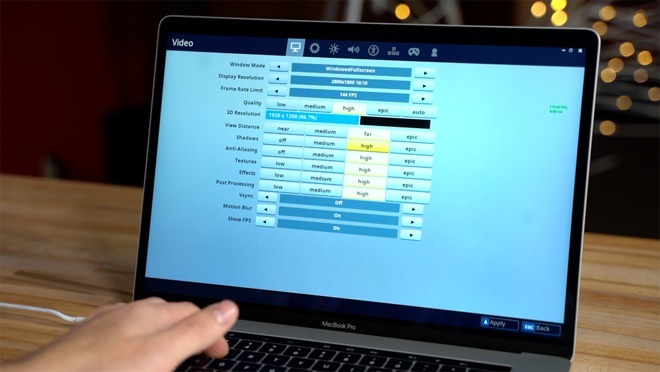 This time, the graphics settings were change to 1,680 by 1,050 and with the presets turned to High to match the macOS gameplay, to see if there is any difference. Right away, the frame rate was up to around 70 to 80 fps, a hefty improvement on macOS. This made the game feel incredibly smooth, rending above the display's 60Hz refresh rate. The resolution was then brought up to 1,920 by 1,200, a bit more than standard 1080p, and the frame rate stayed at between 55 and 60 FPS. This is the sweet spot for competitive gamers who still want the game to look great, with all of the textures and graphics looking very detailed and sharp. So far, we're really impressed with Vega 20. With the previous MacBook Pro with the Radeon 560X graphics option, we could get nowhere near this level of performance. Just for fun, we turned up the resolution to its native 2,880 by 1,800 and all of the graphics presets to Epic. With those settings, we were hovering around 22 FPS on average, definitely not enough to get a decent gaming experience. After bringing the graphics presets down to High, the frame rate jumped up to around 30 FPS, which isn't bad, but definitely not at a level people would want to play games at. It seemed like it was the higher resolution that was impacting the FPS, so the game was set back down to 1,920 by 1,200 with all of the graphics presets to Epic. This time, the frame rate sat at around 40 FPS, and we played for a good amount of time using those settings. While gameplay was just fine, we noticed some frame drops here and there, but it was totally playable. We would recommend 1,920 by 1,200 resolution at High settings for great-looking graphics and around 55 to 60 FPS for an awesome gaming experience. If you're someone who absolutely must have at least 60 FPS all the time, then simply turn down the resolution a little bit to achieve that. Overall, we're extremely impressed with the Vega 20 MacBook Pro. 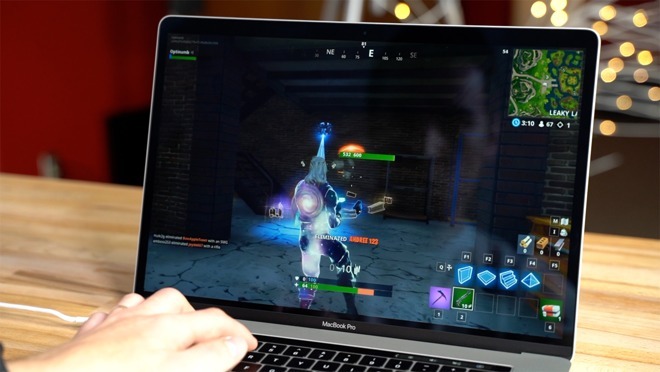 It's the first MacBook ever that can run Fortnite and some of the latest visually-demanding titles like Black Ops 4 and Battlefield 5 at decent graphics settings and frames per second. The Touch Bar makes it difficult if you need the row of function keys, but you can always change the keybindings for that. The fans did kick up, but it wasn't too loud considering how thin this machine is compared to anything else you would usually play games on. One thing we also really like is the speakers on the MacBook Pro, with an audio quality that's far better than any Windows laptop we've ever used. If you're the type of person who needs a high-end MacBook Pro for work, but also want to play some games in your spare time, the Vega 20 MacBook Pro is the first MacBook ever that will satisfy both of your needs. To snap up the discounts, you must shop through the pricing links below or in our Price Guide and enter coupon code APINSIDER during checkout. Need help? Send us a note at [email protected] and we will do our best to assist.